Since coming to the UK in 1996 he has been busy creating, exhibiting and selling his work. 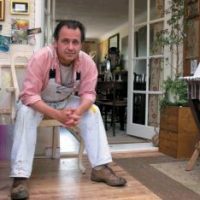 Since 2002 he has been Artist in Residence in Regent’s Park; and since 2009 he has been working with the National Trust as their resident artist for the South East region. His view of the natural world was recognised by the Award for ‘Expressing the Essential Spirit of Holland Park’. He has also received other numerous awards: 2006 – Main Prize Winner – editor’s choice of ‘The Artist Magazine’, and in the same year the Nina Hosali 1st Prize of the Free Painters & Sculptors Society. Other prizes include: Winsor & Newton, Pro Arte, Caran D’ache and Royal Talens. He has also, for a number of years, been creating paintings illustrating classical music. In 2000 he completed a frieze (22 metres by 1.5 meres), entitled ‘Four Seasons, Four Stages of Life’, as a visual expression of Vivaldi’s music. This frieze is shown life as part of the classical performances of the Polish National Radio Orchestra and has been featured on Polish National Television. Following this he has completed four further parts to this frieze to Piazzolla’s version of the Four Seasons, and was commissioned to prepare a separate triptych to commemorate The Year of Chopin in 2010, shown on stage during recitals by prominent pianists. Recently he completed a large painting to the Mussorgsky’s “Pictures from an Exhibition”.